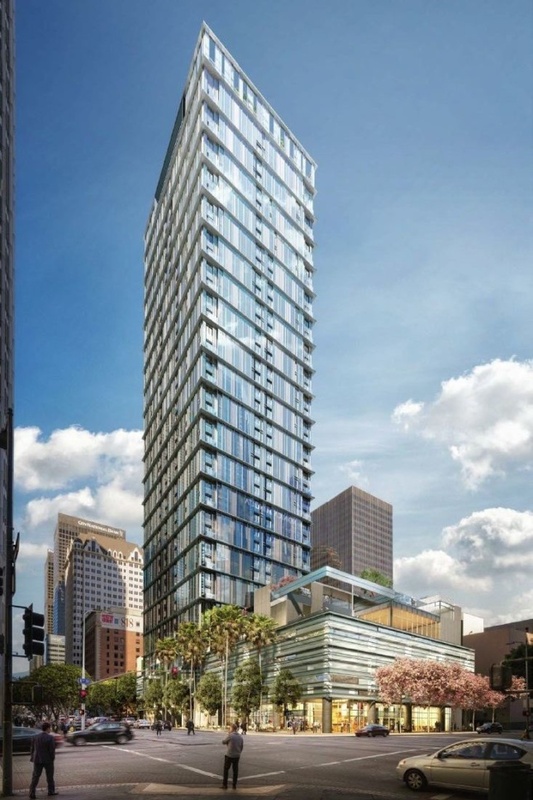 Plans to begin construction have been filed by architects Johnson Fain and developers Mitsui Fudosan America for the newest proposed high-rise tower set to rise in downtown Los Angeles. 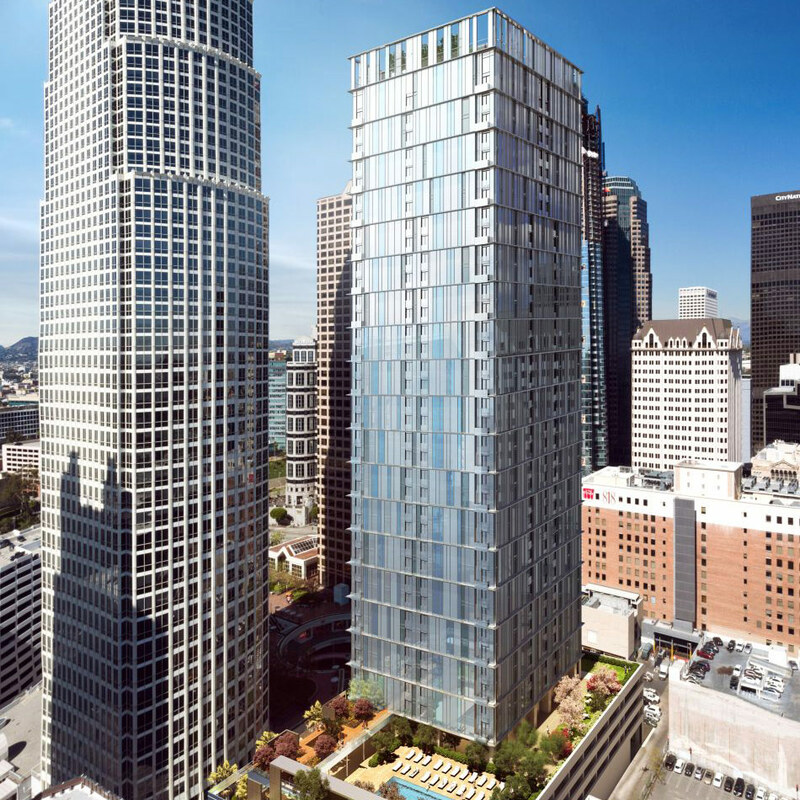 The so-called 8th & Fig tower is to be located at the heart of the city’s downtown financial district, an area that has seen a boom in high-rise construction over the last few years, including the Wilshire Grand Hotel tower, now the city’s tallest tower and highest building west of the Mississippi River, as well as several other adaptive reuse projects and the addition of a new Whole Foods market. The 42-story tower is set to contain 436 residential units that will rise out of a four-story podium containing 10,000-square feet of commercial space along the ground floor as well as an eight-level, 479-stall parking garage with four subterranean parking decks. 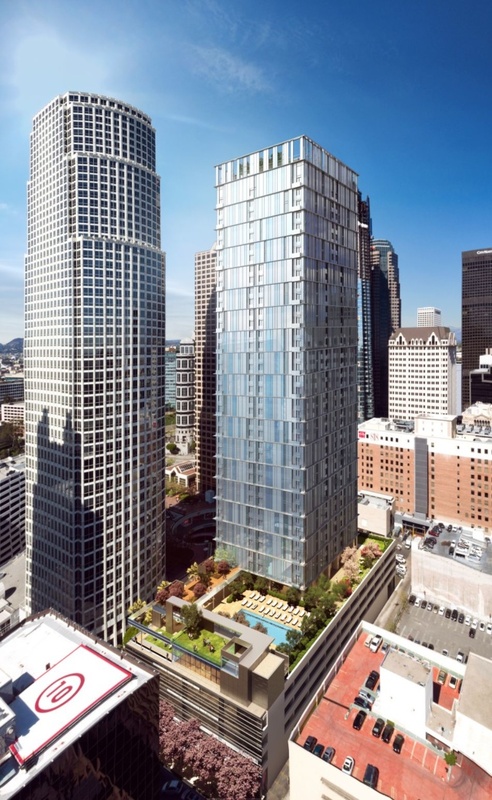 Renderings depicting the glass-clad tower feature striated facades on all sides with each level’s floor plate protruding slightly from the building’s envelope. The podium level will feature amenities like a pool deck as well as what appears to be a series of landscaped, park-like areas. The project comes as Johnson Fain breaks ground on work across the region, with a new mixed-use, 355-unit, mixed-income pedestrian housing complex moving forward in the nearby Chinatown area and the firm’s ongoing renovations to Phillip Johnson’s Crystal Cathedral also moving forward this year. Plans filed with the city detail a March 2018 construction start date, with the project team aiming to open for occupancy the building sometime in 2020.